Christmas horror may in fact be one the the greatest subgenres of all time. Alan Robert's The Beauty of Horror: Ghosts of Christmas coloring book gets treated to its own NSFW claymation video. Santa has been possessed in Robert's Ghosts of Christmas coloring book by the popular undead Ghouliana from the author's previous installments in the series. Santa goes on a crazy killing spree, murdering all of his friends and it's truly disturbing. Everything is so well done, and it's so graphic. It's hard to un-see, so if you're squeamish about watching the Elf on the Shelf get ripped apart, stay away from this video and coloring book. The Beauty of Horror: Ghosts of Christmas claymation video begins when Santa is taken over. He goes from the jolly man we all know and love to a mass murderer in a matter of seconds, taking his axe to the reindeer, including an intense scene of him beheading Rudolph. Frosty the Snowman is than melted down to a puddle of nothing and the elves are torn apart, with the help of Santa's new demonic helpers. The video is not for the faint of heart, but it's a horror fan's dream come true. 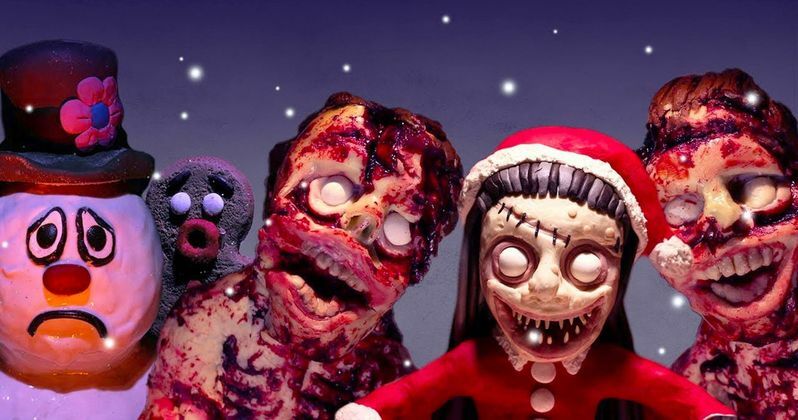 In order to make The Beauty of Horror: Ghosts of Christmas claymation video, Alan Robert collaborated with Trent Shy. Robert says that the two had an unbelievably great time making the video together, noting that they "spent many nights laughing about the endless ways we were gonna torture Santa's reindeer and destroy his workshop." Robert also said that the only rule of thumb that they had when constructing the massacre was, "the bloodier the better." They definitely adhere to that motto throughout the video. Alan Robert sums up The Beauty of Horror: Ghosts of Christmas claymation video best when he says that "It's like an R-rated homage to The Nightmare Before Christmas." Trent Shy said, "This was the most fun I've ever had with one of our claymations," which is also very evident from watching the short film. Shy admits that doing the claymation work can get a bit tedious, but states that it was a "passion project" for him because he loves Robert's work so much. In the end, the duo have created something that is completely unique. Alan Robert brought some of his other coloring Beauty of Horror coloring books to NYCC over the weekend and also showed off the claymation video, which more than likely got a pretty interesting response from people who weren't prepared for all of the Christmas-themed gore featured in the short video. The Beauty of Horror: Ghosts of Christmas coloring book doesn't go on sale until October 30th, but you can watch the incredible claymation video below, thanks to Trent Shy's YouTube channel. Make sure to share the video with any horror enthusiasts who wish that The Night More Before Christmas had more of a violent edge.